Tobiah Horton's Rubble R&D specializes in design, research and installation of landscape features utilizing repurposed materials from demolition and deconstruction of buildings and infrastructure. 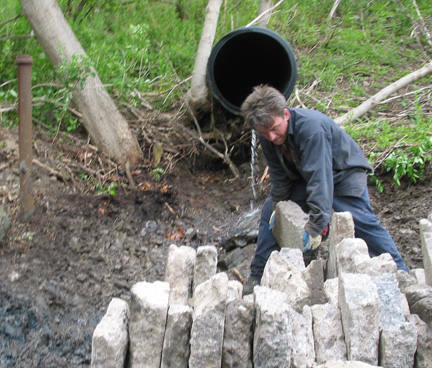 Rubble R&D can provide design, drawings and installation services for useful and fanciful elements such as: walls, paving, follies, sculptures, benches, standing stones, barriers, medians, bollards, head stones, cold frames, foundations, erosion control, slope protection, rip-rap substitute - almost anything that stone can do, broken concrete can as well. Using broken concrete in landscape construction extends the useful life of an environmentally costly material. Good karma and LEED points are available for reuse of materials.